Aside from a few technical tips–like putting a snake over a hat to get them comfortable before a shoot–FitzSimmons loves getting students of his photography workshops excited about little and common creatures, knowing their enthusiasm will lead to conservation of their subjects. He’s one of four professional photographers that lens-makers Sigma agency sends out nationwide. He teaches literature at Ashland University. For his most recent book, wrote Curious Critters, which we reviewed here, he photographed animals against a pure white background. His choices were local–from his own backyard to some of Ohio’s animal tourist attractions. His daughter helped, spotting the cover’s teeny tree frog on the chrome handle of her scooter. He shot a few relatively easy to handle species–a box turtle and a couple frogs–at the Gorman Nature Center, in Mansfield, OH. For a few more he got help from the Toledo Zoo and the Ohio Bird Sanctuary, whose fully flighted raptors were tougher customers. A clever crow flew out of his tent, but then, as if to say, only joking, flew back and landed on his shoulder. There’s a solitary southern flying squirrel in the book. He started out with six, but could only wrangle one. His favorite, though, are bugs. “When you get down to the small world of insects you can see…the scales on a butterfly or little mites on red flat bark beetle.” The book, as we noted, seems as if written by the PR agents of the various species, always showing their best or at least most interesting side. That’s no accident. 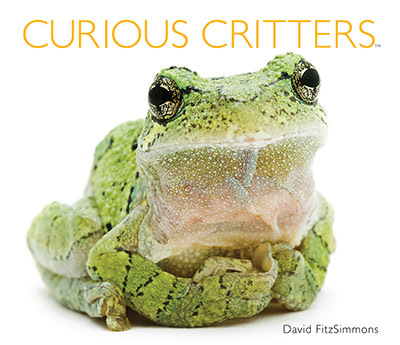 FitzSimmons looked up the K-4 National Science Education Standards for each critter and incorporated them. Then, just to be sure, he sent his text out to experts. Sue Siebert, an expert at Eastern Box Turtle Conservation Trust, told him that his discussion of the species surviving in a non-continuous habitat was fine, but that kids would want to know they have fun lolling around in mud. His next project is a book on vernal ponds, the kind that appear only in the spring thaw and rains. He likes them so much he built one in his own backyard. They’re fast disappaearing in our human structured landscape, but there’s a big push to preserve and recreate them because that’s where some species breed. Cleveland Metropark recognizes the ponds and closes them on the first warm rain of the year when salamanders come out to mate. “There could be 1,000 or more of a species in an area the size of a garage,” he says. It’s a way to have fun watching animals and help save them–right in your own backyard.